Find out which stocks managed to prevent the index from seeing bigger declines. The Nasdaq 100 finished 2018 on a sour note. After seeing gains throughout most of the year, the index ended up losing 1%. Yet even though the Nasdaq 100 didn't manage to gain ground overall, some of its components saw extremely strong performance. Below, we'll take a look at Advanced Micro Devices (NASDAQ:AMD), Workday (NASDAQ:WDAY), and lululemon athletica (NASDAQ:LULU) to see why they were the best stocks in the Nasdaq 100 in 2018. Advanced Micro Devices led all comers in 2018 with an 80% gain. That continued a three-year run for the stock, which has risen about sixfold since the beginning of 2016. Yet some investors have to be disappointed, given that AMD stock had at times during 2018 reached levels tripling where it ended 2017. Coming into 2018, AMD continued to ride favorable trends. Cryptocurrencies were exploding higher, driving demand for Advanced Micro's graphics processing units. At the same time, the overall tech industry's appetite for central processing units was also strong, with cloud computing capacity requiring data servers that can handle the exploding amount of information enterprise customers are gathering. Yet by the end of the year, some of those trends had faded, with cryptocurrency prices collapsing. Even so, AMD has hope for the future, and bullish investors hope that its data center chips can keep gaining ground on the company's competitors. If that happens, 2019 could be another solid year for AMD stock. Check out the latest Workday earnings call transcript. Workday also had an impressive year, with its stock rising 57%. The human-capital management specialist has done an excellent job of making its enterprise HR tools available via the cloud, and its subscription business has generated rising amounts of recurring revenue. A strong employment environment is helping HR-focused companies like Workday, and more customers are flocking to use the HR specialist's platform. With increased expectations for the remainder of the 2019 fiscal year, Workday has shareholders convinced that its growth path extends far into the future, and strong execution could bring further gains for the stock. Check out the latest Lululemon earnings call transcript. Finally, Lululemon Athletica finished the year with a 55% gain. For the yoga apparel specialist, a comeback that's been years in the making drove the stock to new heights, and Lululemon has finally taken full advantage of its opportunities in digital commerce to add to the network effect that its stores have generated for years. Going forward, Lululemon's biggest chance to grow is by expanding into untapped markets. Early efforts to capture more of the men's market have shown promise, and moving beyond athletic wear toward a more universal fashion sense could dramatically expand the audience that Lululemon can serve. Share price advances have already sent the stock to rich valuations, but if the yoga apparel retailer can keep executing well, then it's certainly possible that shareholders will keep reaping rewards in 2019. The biggest stocks that trade on the Nasdaq exchange have a reputation for excellence and long-term prospects, and Lululemon Athletica, Workday, and Advanced Micro Devices have certainly helped take the edge off what could have been a far more painful year for investors than 2018 turned out to be. 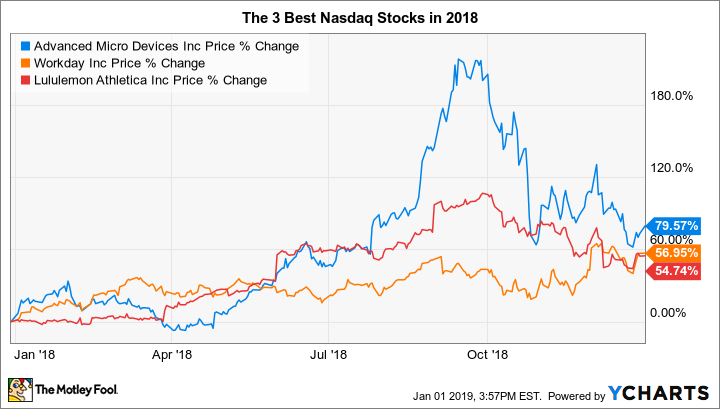 Despite facing future challenges, all three of these stocks have the potential to drive gains for the overall market in 2019 and beyond, and smart investors should keep them on their watch lists in order to see where they end up next.